Monsters (also known as mythical creatures) are creatures with various magical abilities, ranging from magical attacks to various magical resistances. Separate articles are devoted to Goblins and non-magical Animals. The monsters on this page can be found in various Monster Dungeons. They are also all listed in the Oblivion-Creatures-Monsters category. 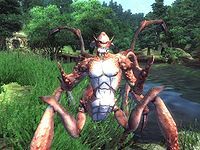 There are very few features common to all of the monsters in the game of Oblivion. Each one has different resistances and different modes of attack. They are discussed together primarily because the game has grouped them together on the leveled lists used to generate enemies: in the same spot where an imp appears for one character, another character will find a minotaur. The creatures listed here are all on the standard leveled lists used to generate monsters in ruins and caves. In addition to the standard lists, there are also some mixed lists that include animals and a few select monsters (imps, will-o-the-wisps, and spriggans). The level provided for each creature in the "Lvl" column is the typical level at which the creature is first encountered. As bosses, creatures will generally be encountered two levels earlier; also, all monsters generated along roads can be encountered two levels earlier. Some creatures' health varies depending upon the player level, indicated by an equation in the Health column. The "lvl" used in the equation is the player's level. The soul for these creatures is usually variable; the souls column indicates the range of soul strengths that are possible. For full details on variable soul strengths see the Souls page. The following table summarizes the standard monster lists that are used to generate random monsters in ruins and caves. Monsters are often mixed in with a few Animals, according to the "Mixed" list shown in the table. All of these leveled lists are only used inside; the lists used to generate animals in the wilderness and along roads are summarized at Outdoors Creatures. There are eight varieties of Minotaurs, four armed (all equally likely) and four unarmed (all equally likely). In most cases, whether the minotaur is armed is randomly determined (with a 1 in 3 chance that it is armed). There is a 1 in 3 chance that a Minotaur Lord will be of the armed variety. Imps are small, winged humanoids who attack with a destruction spell of a randomly determined element. In the wilderness, Imps are found outdoors in all terrains except Farmlands and Plains. Along roads, however, they are only found in Valleys and Hills. 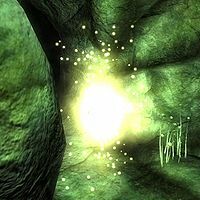 High-level characters may have a hard time finding Imps if they wish to collect Imp Gall for Alchemy. At high levels, Imps will only be randomly generated in Valleys with at best a 1 in 6 chance. Robber's Glen Cave always has 12 Imps inside, regardless of your level. Outdoors, Land Dreughs are only found in Swamp and Rainforest terrains. As mentioned in Brenus Astis' Journal and in conversation, the farmers call Land Dreughs "Billies". 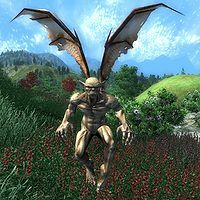 Land Dreughs are actually a temporary metamorphosis of the "true" sea-dwelling Dreugh, which has appeared in earlier Elder Scrolls games. For one year of their life, dreughs undergo Karvinasim and emerge onto the land. In both their land-dwelling and aquatic forms, dreughs produce Dreugh Wax. Minotaurs are large, aggressive, and powerful humanoids with the head and legs of a bull, but the torso of a human. Outdoors, minotaurs are encountered in Hills and Forest Mountains terrains. 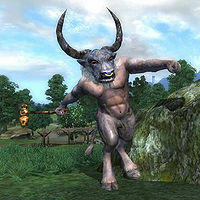 There are four different models of minotaur that differ slightly in appearance (different horns, for example). All other attributes are identical. The four models are all equally likely to appear; all have a 1 in 3 chance of being armed. Minotaur Lords are 16% larger than regular minotaurs with longer, more rounded horns that are even in length, and also tend to be somewhat lighter in color. Minotaur Lords are generated only by boss lists. Outside they are found only on roads (not in the middle of the wilderness), in Hills, Forested Mountains, and Mountain terrains. The Minotaur of the Grove encountered at levels 18+ is also a Minotaur Lord. Ogres are huge, ugly, unarmed humanoids with pale blue skin and tremendous strength. 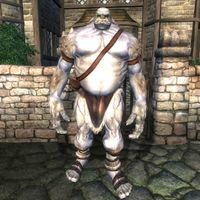 Ogres are found outdoors in Hills, Highlands, Mountains, and Snowy Mountain terrains. They have a weakness to poisons of all types. 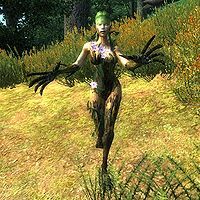 Spriggans resemble a cross between a tree and human woman. They may summon a Black Bear once per day, and their variety of abilities make them very dangerous opponents. They are able to fully replenish their health three times a day. 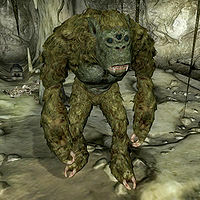 Outdoors, Spriggans are found along roads in Forest terrains, and in the wilderness in Swamp and Forest terrains. They emit quiet, giggling laughter when idle. Trolls resemble green apes with three eyes, and have a distinctive battle howl. They are extremely fast, deal considerable damage and regenerate health, making them potentially dangerous opponents at all levels. Outdoors, Trolls are found in Forest and Rainforest terrains. All trolls are vulnerable to fire attacks (50% or more). The regeneration rate is supposed to depend upon character level but because of the way leveled lists work, these trolls do not regenerate at all. Will-o-the-Wisps are luminous beings seemingly composed of gas. They are immune to normal damage and poison, and have a variety of extremely dangerous magic. They are also very fast and have the ability to become nearly invisible. Outdoors, standard Will-o-the-Wisps are only found in Swamp terrains. Avoiding these creatures is recommended if you are low level and/or do not have a silver, enchanted or daedric weapon. When fighting Will-o-the-Wisps, the most important strategy is to focus on ranged attacks; do not let them come close enough to touch you, since both of their attacks are on-touch. Hand to Hand combat can also be effective if you have the Journeyman perk which enables punches to damage them. Detect Life is extremely useful for seeing where they are located. Another option (if available) is to fight them in the water, since they leave a visible wake in the water, even when invisible. Reflect Spell will reverse the effects of this creature's spells, making them heal your magic or life instead of absorbing it. They are particularly dangerous to NPCs, as most NPCs cannot outrun them, do not have the weapons to damage them, and cannot kill them quickly enough to overcome their Absorb Health ability. Even Imperial Legion Soldiers can easily be dispatched by a lone Will-o-the-Wisp. Near the Shrine of Azura during the Blood of the Daedra quest. These will-o-the-wisps are not aggressive until attacked. Surilie Brothers Vintage 399 A dead troll under a bridge across the bay from Bravil, near the Mouth of the Panther shipwreck. Esta página foi modificada pela última vez à(s) 21h15min de 28 de maio de 2015.